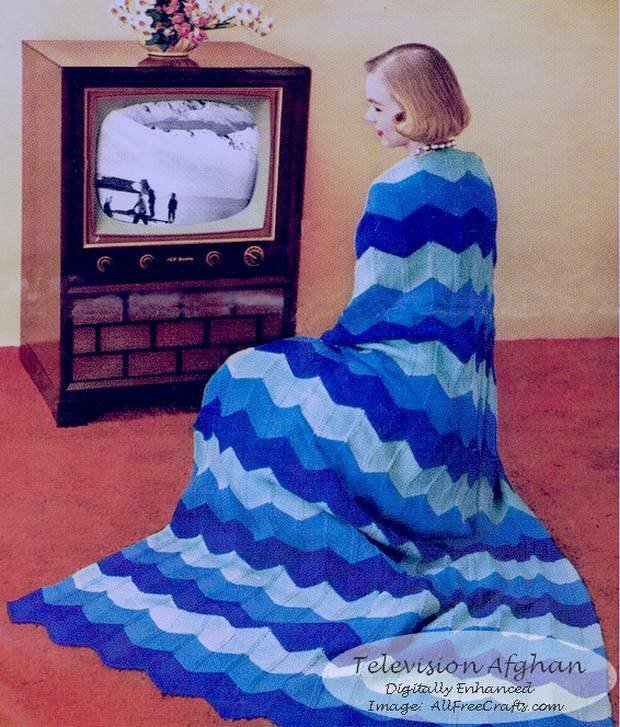 This striking Television Afghan, C-119, is a classic knitted afghan pattern from the 1952 J&P Coats and Clark’s O.N.T. Afghan Book 289, reproduced here in its entirety. 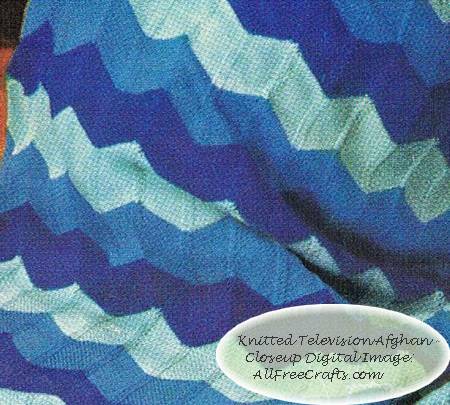 It’s reminiscent of the more familiar wave afghans of the 1960’s and 1970’s. And now, over 60 years since its printing, it certainly deserves a place in the classic knitting pattern archives – as well as a revival among knit-wits like me who cherish making everything old, new again. Finished size is approximately 51 x 66 inches. CHADWICK’S RED HEART KNITTING WORSTED, 4 Ply, Art. E.232: 14 skeins (1 oz. “Tangle-Proof” Pull-Out Skeins) each of No. 809 Lt. Blue, No. 818 Blue Jewel and No. 848 Skipper Blue. Milwards “Phantom” Aluminum Knitting Pins or Clark’s O.N.T. Plastic Knitting Pins, 1 pair No. 5 (3-3/4 mm size). Clark’s O.N.T. Plastic Crochet Hook No. 5. STRIP (Make 10) … With Skipper Blue cast on 31 sts. 1st row: K. 1, inc 1 st in next st, k 11, k 2 tog, k 1, sl 1, k 1, p.s.s.o., k 11, inc 1 st in next st, k 1. 2nd row: P across. Repeat first and second rows alternately until 22 rows have been completed. Break off Skipper Blue, attach Blue Jewel and work in pattern as before for 22 rows. Break off Blue Jewel, attach Ltd. Blue and work in pattern for 22 more rows. Break off Lt. Blue. The last 66 rows constitute the pattern stripe. Continue in this manner, alternating colors as before, until 7 pattern stripes have been completed. Bind off.